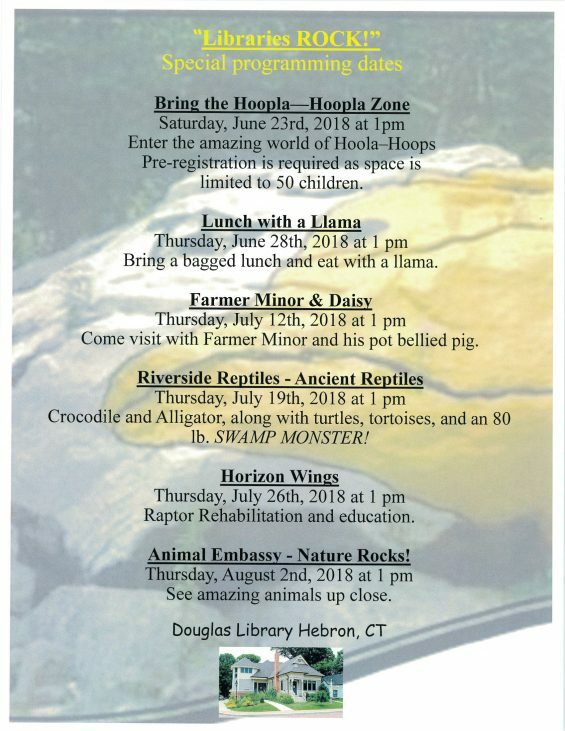 Our ‘Libraries Rock’ Program begins on Saturday, June 23rd and runs through Friday, August 31st. There will be 7 special programs this summer that are free and open to the public. All children under the age of thirteen must be accompanied by a parent or caregiver at all times. Pick up a reading log to keep track of your books and share some of your favorite with your friends. Reading 20 minutes a day during the summer increases retention of skills learned during the school year. We are asking the each child read for 20 minutes per day during this challenge. Fill in at least one READING LOG with the titles of eh books you have read. Bring it into the library between August 4th through August 31st and receive a special prize from your library. Weekly fun prizes are still awarded each week for those who wish to stop in for more books! Our Children’s Program Room is also open during the summer and is stocked with all kinds of craft and drawing project.